These scones, with their oats, nuts, and milk rather than cream, at least approach being “healthy.” We love the way they taste, but they are also a concession to our customers who want something they can feel better about eating for breakfast. They can be even “healthier” if you switch out some of the white flour for whole wheat flour. It’s possible to swap as much as half the white flour for whole wheat flour without adjusting the other ingredients. If you use more than that, you will want to increase the milk quantity, because the whole wheat absorbs more liquid than white flour. Heat the oven to 325°F [165°C]. Toast the pecans on a sheet tray for 12 minutes, until toasty brown. Start checking after 8 minutes. In a large bowl, combine the flour, sugar, oats, baking powder, baking soda, pecans, raisins, and salt. Stir to mix evenly. In a small bowl, lightly beat the egg and then add to the dry ingredients, along with the butter, milk, and vanilla. Mix until completely homogeneous. This is a very wet and sticky batter. Using a 2-oz [59-ml] portioner or a ¼ cup measure, scoop the scones onto a sheet tray with at least 2 in [5 cm] between them. Place a little flour on your hands and gently flatten the scones into disks 2 in [5 cm] thick. Chill the scones for at least 30 minutes. This will help them attain more loft as they bake. Preheat the oven to 375°F [190°C]. Make the egg wash by beating together the egg, egg yolk, and water in a small bowl. In a separate small bowl, combine the cinnamon and sugar. 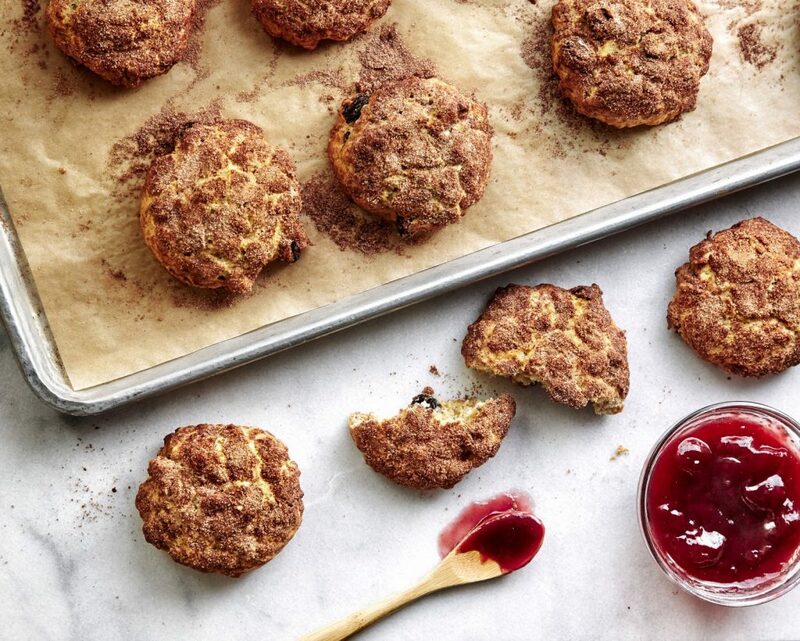 Using a pastry brush, apply egg wash to the top of each scone and then generously sprinkle with cinnamon sugar. Bake for 15 minutes, or until a nice golden color. Cool on a wire rack.